Editor’s note: Toby M. Cadman is a London based international barrister specializing in war crimes, international terrorism, extradition and human rights. He served as legal counsel to the chief prosecutor of the Bosnian war crimes chamber. The views expressed are his own. Days of bloody riots in Dhaka are spreading throughout the country; scores are dead thousands injured. 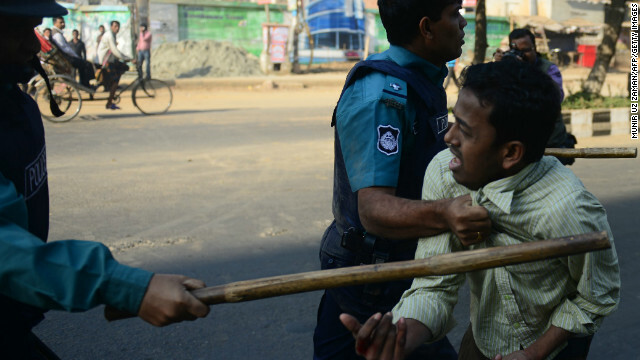 Bangladesh has a long history of civil unrest but the current situation is approaching historic proportions. In the past, unrest has led to military coup. Six months ago, another coup was unthinkable; now it is apossibility increasingly being discussed. Yet while some have compared the protests to the Arab spring, nothing could be further from the truth. In Cairo, people ousted a dictator and demanded democratic reform. In Dhaka, the demonstrations are comprised of two camps: the larger is made up of those seeking immediate execution of people convicted of war crimes related to the 1971 war of independence; the other is made up of those who believe the war crimes tribunals are show trials allowing the government to eliminate the leaders of a critical political party that threatens to shift the balance of power in upcoming elections. I am a member of the defense team, but was expelled from the country for complaining about the lack of due process. I am not a politician. I support no political party in Bangladesh. But I do support the rule of international law and believe that the ongoing defilement of that rule not only threatens the lives of presumed innocent defendants, it also is placing the country on the brink of chaos. The 1971 war pitted the two Pakistans against each other. The East and West Pakistan concept created in 1947 by the British during their departure from the subcontinent resulted in an unworkable bifurcated “nation” separated by more than 1,000 miles, with two distinct languages and cultures. The concept was to split the subcontinent by religion: India is primarily Hindu, the Pakistans Muslim. But the Pakistans shared little beyond Islam revolution was inevitable. The war was bloody, with as many as 3 million people killed in East Pakistan, according to the Bangladeshi side, thousands raped and unknown numbers tortured. As part of the India-brokered treaty, Bangladesh became an independent state and the Pakistan military received effective amnesty. Bangladeshi collaborators received no amnesty. The Awami League-led government created the War Crimes Tribunal in 2010, basing it loosely on tribunals like Nuremberg. The government rejected suggestions from the international community of the necessity for transparency, strict adherence to legal precedent and involvement of unbiased outsiders. The government wrote its own rules. Charges were brought against 11 suspects out of an estimated total of 1,600. Each defendant held leadership roles in the opposition party Jamaat-e-Islami. In the history of Bangladesh, elected governments have rotated between Awami and BNP led coalitions. Historically, each time BNP held power, its majority relied on a Jamaat coalition seat. Without Jamaat’s votes, BNP is unlikely to regain power. Early procedural actions by the War Crimes Tribunal raised concerns among bodies including the U.N. Working Group on Arbitrary Detention. Foreign lawyers, including myself, were prohibited from participating on the defense team, prosecutors were given great latitude and defense lawyers limited in the ability to cross-examine and present evidence. Last year, a series of tapes and emails surfaced that seemed to suggest collusion between the chief judge of the tribunal, the prosecutors, outside pro-government consultants and indications of direct instructions from the cabinet for quick convictions and death sentences. The evidence seemed to confirm the international community’s concerns and led to the resignation of the judge. But his replacement stuck to the original playbook and the convictions are now coming down. Demonstrations followed the first conviction, with pro-government mobs demanding the tribunal forego appeals and move straight to the gallows. A second conviction with a life imprisonment sentence amped up the mobs and demonstrations turned to riots. But with the recent conviction of Jamaat leader Maulana Delwar Hossain Sayedee, the country is exploding. And, while there are indications the police took a policy of turning a blind eye toward pro-government rioters, they now seem to have lost control. As someone who prosecuted war crimes in Bosnia, I understand the need for justice. However, I do not believe that there can be justice under the current tribunal, which is at best suspect, at worst a tool of a government looking to execute politicians for electoral gain. What is required now is immediate and effective action to ensure that the trials of the accused before the tribunal are suspended pending an independent, international investigation into the serious allegations of gross misconduct against members of the tribunal including judges and prosecutors, as well as senior members of the Bangladeshi Government and undeclared third parties. It is unclear what steps, punitive or otherwise, the U.N. Human Rights Council will take in Geneva over the coming weeks. It will also be deliberating on Syria, Burma, Bahrain and Sri Lanka. Arguably, two weeks ago, Bangladesh paled in comparison to these, but the events of the past several days paints an entirely different picture. Bangladesh is descending into sectarian conflict every bit as serious as its competitors for attention, and has now matured into a fully-grown problem for the United Nations. Failure to find a resolution could see the country descend into civil war.